Yellowstone is where planet Earth really shows off. You want geysers shooting superheated water and steam hundreds of feet into the air? You got it. Herds of bison, otherworldly hot springs, and a canyon that rivals the Grand in beauty? Check, check, and check. About the park. Yellowstone is a big, big park―at nearly 3,500 square miles, it’s larger than Rhode Island and Delaware combined. There are dozens of must-see sites, and one can easily be an hour’s drive from the next (especially because on any given summer day you’ll be slowed by park road construction). This is a park where you’ll want to take your time. Yellowstone sits atop a 1,500 square mile volcanic caldera. While the last big eruption ocurred an estimated 640,000 years ago, continuing volcanic activity fuels the park’s mud pots and geysers―sixty percent of the world’s geysers are here. Water is another force. The Grand Canyon of the Yellowstone―equal in beauty if not in size to the more famous Grand Canyon in Arizona―was shaped by the Yellowstone River carving its way into the park’s signature gold-colored rock. The canyon’s two waterfalls―Upper and Lower Yellowstone Falls―are the best-known of the park’s 300-plus cascades. Yellowstone Lake is the largest high altitude lake in the United States. Yellowstone’s human residents have mostly lived up to its natural wonders. The National Park Service offers a full schedule of ranger-led hikes and other activities; the Yellowstone Institute offers terrific classes for kids and adults. The park’s historic hotels―Old Faithful Inn, Mammoth Hot Springs Hotel, and the Lake Yellowstone Hotel―are so evocative of the past they’ll transport you to an earlier, more gracious era of national park tourism. It’s time travel―but what else would you expect from a park that’s pure magic. Planning your visit. Yellowstone lies in northwestern Wyoming (with slivers of the park stretching into Idaho and Montana). Nearest airports are at West Yellowstone and Bozeman, Montana, and Cody and Jackson Hole, Wyoming. When to go: Summer is peak visitor season in the park, which means rooms and campsites can be hard to find. Weather is generally good but changeable: expect sunny days in the 70s, interrupted by occasional summer thunderstorms, even hail. September and October can be beautiful, with fewer crowds, great fall color, and good wildlife watching, it’s one of the best times to go. Winters are snowy and very cold (with lows in the 10s), but the Yellowstone Snow Lodge and Snow Coaches give winter visitors a chance to see the park and its wildlife in near-solitude. Spring comes late here, with some park roads not open until May. 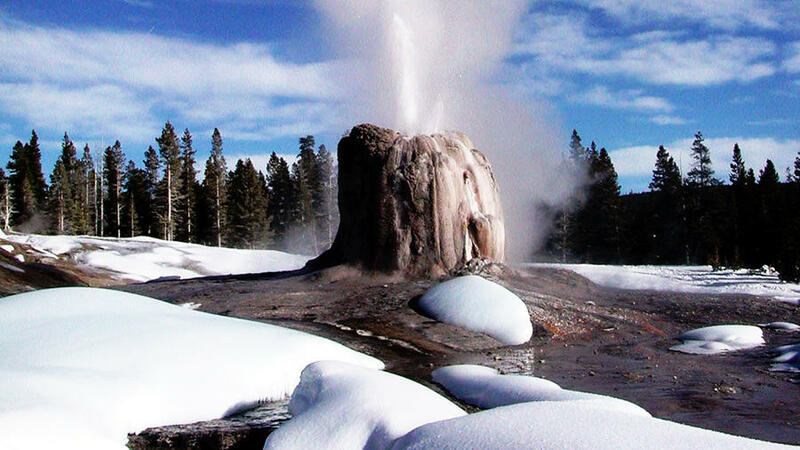 First-time essentials: Start with the park’s hydrothermal mascot, Old Faithful, but don’t ignore other nearby spouts, like those on aptly named Geyser Hill. From there, it’s a short walk to the Old Faithful Inn (opens in May), the timbered lodge that’s a heavenly hybrid of castle and treehouse. Then head to the Grand Canyon of the Yellowstone: Trails along both north and south rims give unforgettable views of the canyon and its waterfalls. Finally, hit Lamar Valley, a favored location to observe Yellowstone wildlife, from bison to elk to river otters. Animal Spotting: As for animals, Yellowstone has perhaps the best wildlife watching opportunities of any park in the country. Visit Lamar or Hayden valleys towards dusk and you’ll have a good chance of seeing elk and coyote. Bighorn sheep gather at Dunraven Pass. Yellowstone’s fiercest inhabitant is the grizzly bear: there are an estimated 600 of them in the park today, and if you’re lucky you’ll get a chance to admire one or two from a safe distance. To ogle bears—black and grizzly—head to Lamar Valley, and for bighorn sheep, keep an eye on the cliffs spanning the 5 miles of road from Gardiner, Montana, to Mammoth Hot Springs. And about 100 gray wolves, reintroduced to Yellowstone in the 1990s, can be spotted near the Blacktail Plateau (they’re easiest to glimpse in winter). Nearby places to see: When you’re planning your trip, allow time to explore some of the gateway towns near the park. Cody, Wyoming, has the world-class Buffalo Bill Historical Center; Jackson blends old west history with new west luxury. At the north end of the Beartooth Highway―possibly the single most beautiful road in America―Red Lodge, Montana is an appealing mountain town; Bozeman has its own excellent Museum of the Rockies and an entertaining downtown. The nearest towns to the park―West Yellowstone, Gardiner, and Cooke City, Montana―have fewer tourist attractions, but do boast decent restaurants and lodging.